DENVER, Feb. 3, 2015 /PRNewswire/ — New Town Builders, a Colorado-based homebuilder and leader in the design and construction of energy-efficient homes, captured two high-level honors for its Net Zero Energy home design at last week’s National Association of Home Builders (NAHB) International Builders’ Show (IBS), the largest and most prestigious gathering of the residential construction industry. The winners were announced in Las Vegas at the annual IBS event. New Town’s ArtiZEN Plan – designed with meticulous attention to every aspect of home energy efficiency – was named Best in Green among Single-Family Production Homes by NAHB. This is the first year NAHB has given Best in Green Awards, and just nine of these prestigious honors were bestowed. The National Sales and Marketing Council (NSMC), a council of NAHB, also recognized New Town’s ArtiZEN Plan with a Gold Nationals Award for Best Green/Sustainable Home Design. The National Sales and Marketing Awards competition pays tribute to superior sales and marketing achievements by individual professionals, homebuilders and associates, and sales and marketing councils. New Town was among approximately 60 award winners. New Town CEO Gene Myers was honored that his small local builder has risen to such esteem in this billion-dollar industry. These awards, he said, highlight the vision, accomplishments and pride behind what the sustainable production builder seeks to achieve every day, with every home. New Town Builder’s ArtiZEN design is part of its Z.E.N.™ (Zero Energy Now)Collection, the first home collection in the United States to be 100 percent Net Zero Energy standard. The home boasts a HERS (Home Energy Rating System) score of below zero, meaning the home produces more energy than it uses. An average Energy Star-rated home has a HERS score of roughly 70. New Town’s solid green-building reputation has been recognized repeatedly since the company launched its Z.E.N.™ (Zero Energy Now) Collection. In September 2014, it received the Department of Energy’s Grand Award for Housing Innovation for the second consecutive year, given to the nation’s most sustainable, forward-thinking builder and recognizing that New Town’s homes deliver a whole new level of home performance, with rigorous requirements that ensure outstanding levels of energy savings, comfort, health and durability. New Town Builders is an award-winning, Colorado-based homebuilder and a leader in the design and construction of energy-efficient homes since 1993. 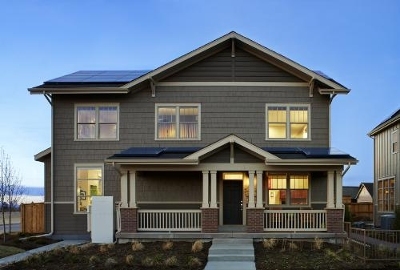 With a commitment to living that is sustainable, beautiful and affordable, New Town was Colorado’s first production builder to equip homes with solar panels as a standard feature and the first production builder to offer a Net Zero Energy option on all single-family homes inDenver. Today the company offers award-winning, DOE Certified Zero Energy Ready homes designed in craftsman and contemporary styles throughout Denver and its suburbs. For more information, visit www.newtownbuilders.com.